The countdown is over. Demand Zero Day is finally here. 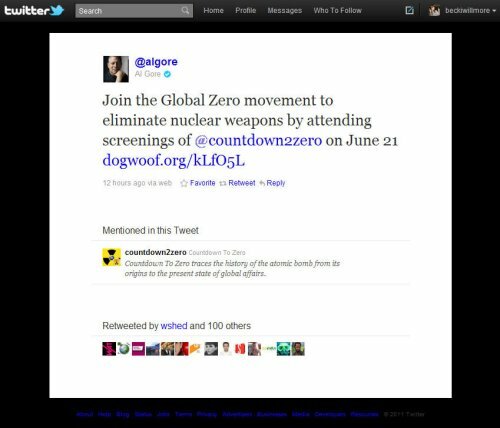 Ashton has urged people to join the Global Zero petition and Al Gore is showing his support for tonight’s nationwide premiere of Countdown To Zero on Demand Zero Day. Demand Zero Day will see the live broadcast from BAFTA of a high-profile discussion panel featuring Her Majesty Queen Noor of Jordan, Margaret Beckett (former Foreign Secretary), Valerie Plame-Wilson (ex-CIA operative) and producer Lawrence Bender (An Inconvenient Truth, Inglourious Basterds). Demand Zero Day is your opportunity to pick this amazing array of brains about Countdown to Zero's message.